EU leaders are set to extend Brexit by up to a year at an emergency summit in Brussels today - counter to Theresa May's request. The Prime Minister is set to repeat her call to delay Brexit until June 30, with the possibility of an earlier departure if the UK's withdrawal deal is ratified. Mr Tusk, in a letter to the heads of the 27 remaining member states, said there was "little reason to believe" that the ratification of Mrs May's beleaguered Brexit deal could be completed by the end of June. Mr Tusk wrote: "The flexibility would allow to terminate the extension automatically, as soon as both sides have ratified the Withdrawal Agreement. "The UK would be free to leave whenever it is ready. And the EU27 would avoid repeated Brexit summits. "Importantly, a long extension would provide more certainty and predictability by removing the threat of constantly shifting cliff-edge dates. "Furthermore, in the event of a continued stalemate, such a longer extension would allow the UK to rethink its Brexit strategy." Mr Tusk also warned that "neither side should be allowed to feel humiliated at any stage in this difficult process". It follows Mrs May's whistle-stop tour on Tuesday of European capitals for talks with French President Emmanuel Macron in Paris and German Chancellor Angela Merkel in Berlin. DUP Westminster leader Nigel Dodds branded the talks "humiliating and embarrassing" for the UK, and claimed Britain was "effectively holding out a begging bowl to European leaders". 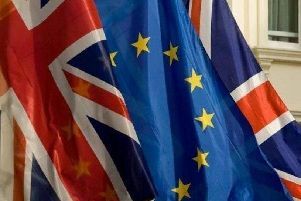 The unanimous agreement of all 27 remaining EU states is needed to avoid a no-deal Brexit on the scheduled date of Friday, April 12. On Tuesday evening MPs approved a Government motion for Mrs May to seek an extension to June 30 by 420 votes to 110, majority 310. However, 97 Conservatives rebelled by opposing the plan - including former Brexit secretaries David Davis and Dominic Raab. Mrs May will face the Commons for Prime Minister's Questions on Wednesday afternoon before she heads to Brussels where she is expected to meet Mr Tusk ahead of the summit. EU leaders will then gather for talks with European Parliament president Antonio Tajani, before hearing from Mrs May. They will then meet for dinner without her to agree a response to the UK's extension request. A press conference with Mrs May is likely to be held after the summit, and the PM is expected to update MPs on Thursday. Meanwhile in Westminster, Labour claimed the Government had not yet made a "clear shift" in its position in cross-party talks designed to break the impasse. Discussions will resume on Thursday.